In the Democratic Republic of Congo, there has been a mixed response Monday from opposition parties and civil society to President Joseph Kabila's call for a political dialogue to sort out election issues. The biggest opposition party, the UDPS, has not issued a public communiqué in response, but has given the president's call a mild welcome, while other opposition parties have rejected it. UDPS spokesman Augustin Kabuya told VOA that a dialogue is needed to settle electoral issues, without which elections cannot take place. The people cannot be led into polls that would be doomed from the start, he said, adding that while it is common knowledge that no preparations have been made for the cycle of elections scheduled in 2016, some people are pushing to go straight to voting. Kabuya rejected accusations that the party plans to reach a power-sharing deal with Kabila, allowing him to remain in power beyond his constitutional two-term limit, which ends in December 2016. 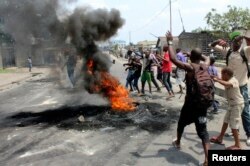 FILE – In January 2015, demonstrators burned tires to set up barricades during a protest over proposed changes to an election law in the Democratic Republic of Congo's capital Kinshasa. The UDPS party wants the elections to occur on time, within Kabila's two-term limit, Kabula said, but for that to happen the parties need to sit down and discuss electoral issues. The other two main opposition groups, known as the G7 and the Opposition Dynamic, met Monday and issued a joint statement. The statement said Kabila's agenda for the dialogue, which includes discussing a change in the electoral system, clearly shows he intends to remain in office. The statement also accused Kabila’s government of many failings. Faced with this situation, said Ingele Ifoto of the Opposition Dynamic, the only option left is to rise up and march. "We say no to the dialogue, no to a government of transition, no to a violation and change of the constitution, no to a referendum, no to the president hanging on to power, and yes to strict respect for the constitution," Ifoto said. According to Kabila, civil society groups will be invited to the dialogue. But Jean Claude Katende, a member of human rights group ASADHO, told VOA that Kabila's agenda for the dialogue has increased the group’s concern that he is thinking of changing the constitution. Katende said the agenda is aimed at introducing indirect presidential elections. Government spokesman Lambert Mende has said the president intends to respect the constitution.